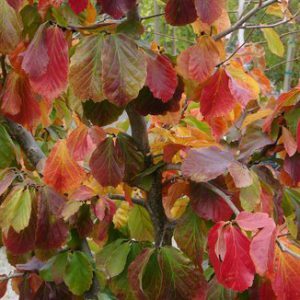 A fantastic little tree; pink buds open to deep red flowers in the Spring with bronze red young leaves that turn green with red veins. In the Autumn the red-orange fruit is long lasting through to the Winter. Prefers a sunny, sheltered spot. Eventual height of around 6metres. It’s rare to find specimens of this size available as the growth on these trees is slow.